Marshall is entertaining mythbuilding. A courtroom drama whose purpose is to highlight the strength of character of an important American man. 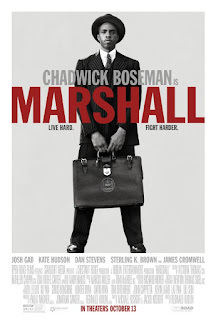 Chadwick Boseman plays Thurgood Marshall as the charismatic leading man he is. He is heroic, almost perfect. He is mythic. While Thurgood Marshall's accomplishments are remarkable he was human. The film, like so many biopics before, isn't really about him. It's about the struggle for justice in racist America and it needs a hero. Marshall is that hero. Marshall is filmed as courtroom drama. It doesn't attempt to tell the life story of the man, instead focusing on one case, this one snapshot in time. It is dramatic and perfectly illustrates the nature of how the justice system was (and remains) set up against people of colour. The story is clearly for its purpose. And it is damn good. Entertaining, dramatic, with all the hallmarks of good legal drama. Marshall is a fun and inspiring ride. Boseman exudes leading man charm and here he puts it all to good use. His Thurgood is a champion, a role model. He is magnetic on the screen. This is a star making turn. Boseman doesn't get to play nuance here, the film's characterization doesn't allow it, but he does amazing work with what he is given. His Marshall is incredible to watch. What is somewhat fascinating about Marshall is how its story is about difficult questions in this metoo period in time. The film justifies not believing the woman who is claiming she was raped. It is about using her sexual morals and her promiscuity against her. And it is about how doing so is justified. This is a challenging story. It touches on the intersections of racism and male violence against women, yet it sweeps most of that part under the rug. There are moments where Marshall could have been even more interesting than it is if it had been open to more complexity. But as I said, that's not the point of Marshall. Things need to be more cut and dried than that. 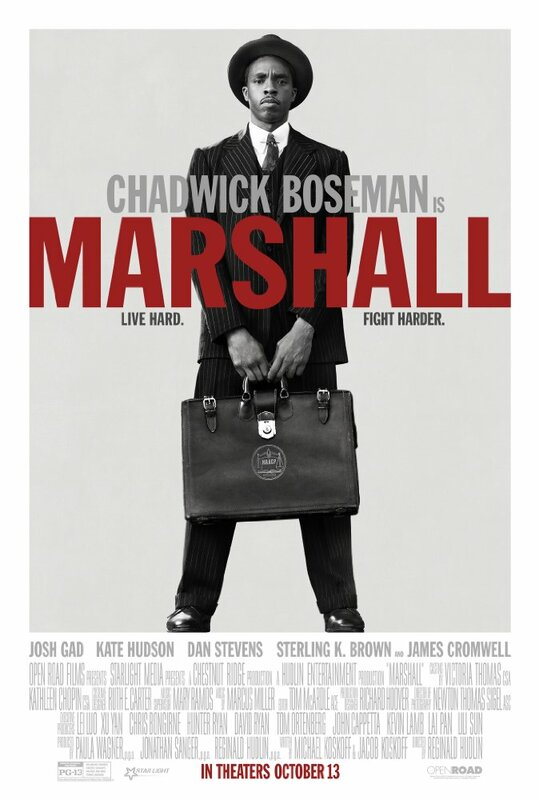 Still, Marshall presents a strong inspiring story and juicy courtroom drama. Marshall is good cinema. It may not be the most nuanced history lesson, but it hits all the notes we would want.